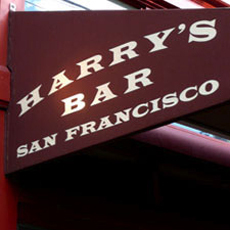 A Pacific Heights neighborhood favorite for over 35 years, Harry's Bar is a San Francisco landmark. Located in the historic Fillmore District, Harry's Bar has enjoyed an exciting history which has made it one of San Francisco's most legendary bars. Harry's inspires its guests with an elegant take on a neighborhood bar, a true modern classic. The dark mahogany wood, refined leather and antique brass create a comfortable yet elegant atmosphere.